Millennium offers The Daring Way™ and Rising Strong™ three-day intensive workshops. 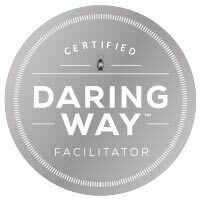 These are facilitated by Ann Foster, our Founder and President, who is a Certified Daring Way™ Facilitator (CDWF). We use the official and approved new and ground-breaking curriculum developed by Dr. Brené Brown and her team. For more information, contact Monica Connelly at 312-460-8001 or through her email at monica@millenniumhope.com.